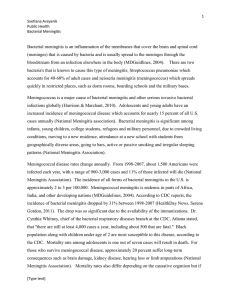 Meningitis (from Greek μῆνιγξ méninx, ""membrane"" and the medical suffix -itis, ""inflammation"") is an acute inflammation of the protective membranes covering the brain and spinal cord, known collectively as the meninges. The inflammation may be caused by infection with viruses, bacteria, or other microorganisms, and less commonly by certain drugs. Meningitis can be life-threatening because of the inflammation's proximity to the brain and spinal cord; therefore, the condition is classified as a medical emergency.The most common symptoms of meningitis are headache and neck stiffness associated with fever, confusion or altered consciousness, vomiting, and an inability to tolerate light (photophobia) or loud noises (phonophobia). Children often exhibit only nonspecific symptoms, such as irritability and drowsiness. 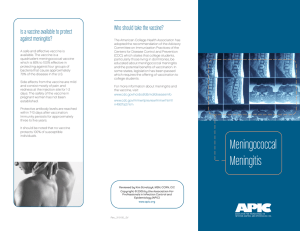 If a rash is present, it may indicate a particular cause of meningitis; for instance, meningitis caused by meningococcal bacteria may be accompanied by a characteristic rash.A lumbar puncture diagnoses or excludes meningitis. A needle is inserted into the spinal canal to extract a sample of cerebrospinal fluid (CSF), that envelops the brain and spinal cord. The CSF is examined in a medical laboratory. The first treatment in acute meningitis consists of promptly administered antibiotics and sometimes antiviral drugs. Corticosteroids can also be used to prevent complications from excessive inflammation. Meningitis can lead to serious long-term consequences such as deafness, epilepsy, hydrocephalus and cognitive deficits, especially if not treated quickly. Some forms of meningitis (such as those associated with meningococci, Haemophilus influenzae type B, pneumococci or mumps virus infections) may be prevented by immunization. In 2013 meningitis resulted in 303,000 deaths – down from 464,000 deaths in 1990.